To touch, or not to touch? Art museums, as opposed to children or science museums, are often thought of as places for looking and not touching. As you walk through the galleries you will hear parents reminding their children to not touch, and most people immediately understand why. You wouldn’t want to accidentally stain William Merrit Chase’s Portrait of Grace Beatrice Dickerman or break Beth Lipman’s carefully blown glass still life. While recently speaking about the Chipstone Foundation’s Green Furniture exhibition, however, I found myself discussing the merits of touch and the opportunities the Milwaukee Art Museum presents for exploring this sense. “Touch” is something we constantly discuss at Chipstone. The Chipstone Foundation focuses on the decorative arts, and although many of our objects are currently displayed on pedestals and cases because of their aesthetic and historic significance, they were originally created to be used. Chairs were sat upon. Tables had plates and teacups set on them, which in turn were used to eat. It made us wonder: what do you lose when you can only look at an object? Can you understand a carver’s full mastery without touching the object’s curves? Can you tell what objects allowed their owners and guests to get close? Can you tell whether a chair is comfortable or uncomfortable without sitting in it? What about the way it would position your body, and what that said about your role in the household? It seemed to us that with the decorative arts, most of the time just looking does not provide a full and rewarding experience. We decided to try a couple of interactive experiments. The first is our Chair Park. The Chair Park consists of reproductions of a variety of historic and iconic chairs, which the visitor is allowed to sit on. This area has proven even more successful than we could have predicted. There are constantly groups of people sitting on the chairs, comparing which ones they like and dislike, and engaging in general conversation. It has become both a meeting place and a comfortable space to discuss the objects themselves. Visitors often have a favorite chair and happily explain why they love it. For example, some love the Frank Lloyd Wright chair because they feel a connection to the famed architect, while others find it insufferably uncomfortable. The chairs become more accessible and consequently more interesting. The information that is gained from experiencing the different objects is invaluable and could not be effectively transmitted through a label (nor would it be as fun!). 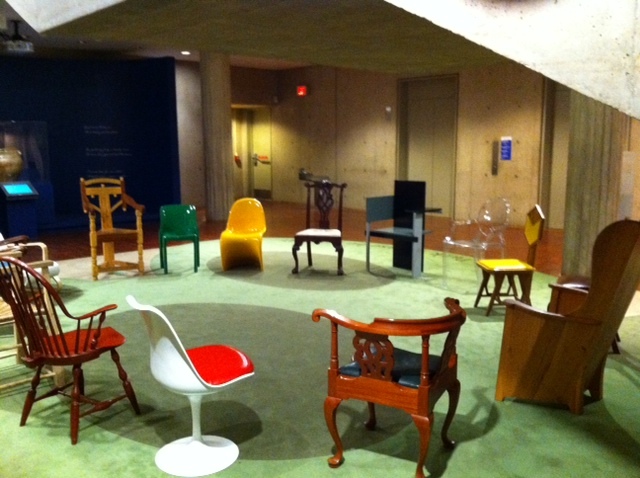 Our temporary exhibition, Green Furniture, was another opportunity to explore the value of touch. The show featured works made by contemporary artists working within the Green movement. As we were planning the show, we realized that it would cost almost the same amount to pay shipping and loan fees for the exhibition’s objects as it would to buy the furniture. We opted to buy the furniture, and allowed visitors to touch, sit and fully experience all of the artworks. We heard from visitors that being able to use the objects helped them better understand them, making the exhibition more accessible. As I discussed this with curators from other institutions, their first reaction was to ask: “Didn’t the objects get damaged? Didn’t visitors then believe they could touch anything else in the museum?”. I was happy to report that no, they didn’t. When given the opportunity to touch, the visitors were respectful and careful, while instinctively understanding that being allowed to sit in a Mud Chair did not mean that they could then go run through the Cornelia Parker installation upstairs. Although Green Furniture is no longer on view, we hope to see you sitting down in our Chair Park and look forward to hearing your thoughts on the different chairs! 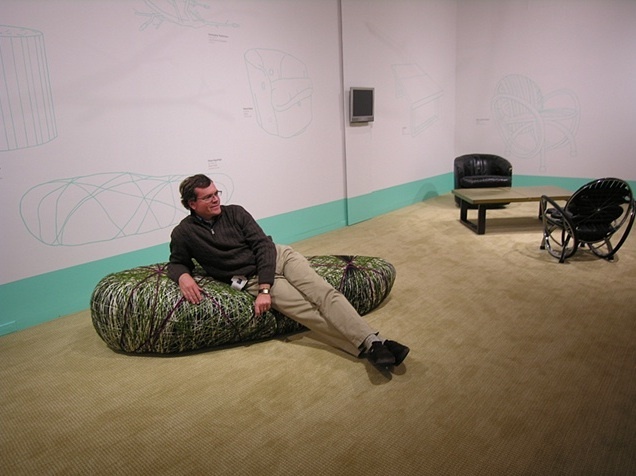 This entry was posted in Art, Curatorial and tagged Chair Park, Chipstone Foundation. Bookmark the permalink. 1 Response to To touch, or not to touch?